Picture above from left to right - Our friend Marlaina, Ed, and our nephew Nic. This high stakes meeting is taking place to discuss finances. My nephew graduated from high school this year and Ed and I gifted him with money to start a retirement account. We invited him for lunch one day and gave him whatever pearls of wisdom we could offer, and then Ed talked to him about all the boring money stuff that I'm not very interested in. Nic is a math whiz, an honor student, and has plans to go into the medical field, so starting him early with the financial stuff seemed like a no-brainer. Enter Marlaina. She's a scholar of investing. Reads about it, thinks about it, breathes it. Every day she's on the 'net checking out the markets, monitoring her stock, and reading the financial websites and blogs. She turned Ed on to Mr. Money Mustache and suggested The Whitecoat Investor for my nephew, a blog written by a doctor for doctors. Of course, anyone can benefit from either of these sites and I can tell you from my experience - which is mostly learning through osmosis - that if you read enough on a subject, you will eventually benefit from the knowledge gained. As you can see, the discussion is intense. 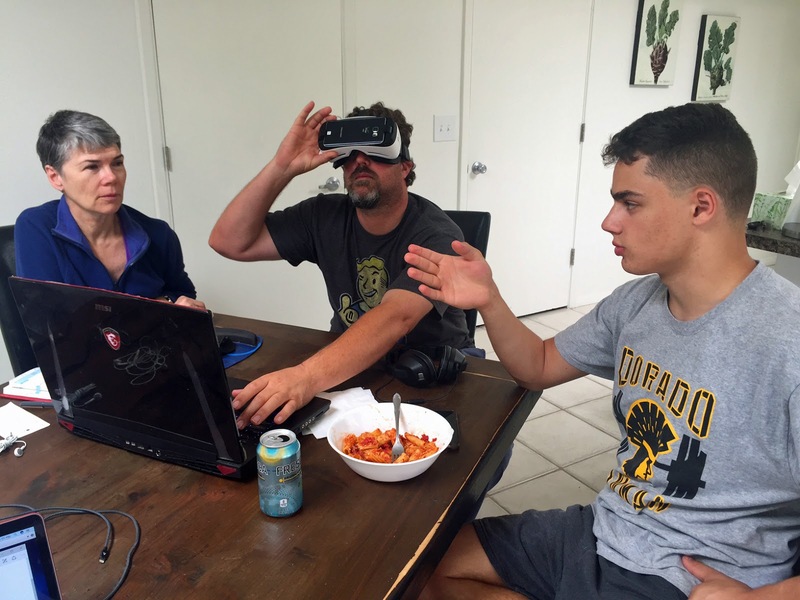 Nic talking, Marlaina listening, and Ed playing with his virtual reality headset. Exactly the setting in which to plot the path for your financial future. A business line of credit is a top-notch option for the ones who've to get entry to it. However, for lots others, Loans Geeks will gift a superb possibility to get matched against an extremely good range of official loan creditors in Canada, who provide small business loans at aggressive quotes, in a clean, fast and trouble-loose manner. Our lender overcoming swap prices and cost-free wire moves are ideal for Canadians acquiring US real-estate, relocating overseas, delivering money to loved ones, and paying out foreign tuition. We undercut the lender swap rates. Bank change prices website might include margins of up to 2.5Per cent and the majority of Canadians are unaware they may do considerably better. We get in touch with banking institutions every day to guarantee our change charges are better. keep posting more n more n more.